What you don't know can hurt you more. The more you know about any medication you use, the better you can be sure you're using it properly. For each drug you take whether it's a prescription medication or an over-the-counter drug know about it properly if you can't find the information on the medication bottle or in the patient information that came with the medication or have trouble understanding the information, be sure to ask your doctor or pharmacist. •DO take each medication exactly as it has been prescribed. •DO make sure that all your doctors know about all your medications. •DO let your doctors know about any other over-the-counter drugs, vitamins, supplements, and herbs that you use. •DO try to use the same pharmacy to fill all your prescriptions so that they can help you keep track of everything you're taking. •DO keep medications out of the reach of children. •DO read medication labels carefully with each dose. •DO use a 7-day medication organizer. 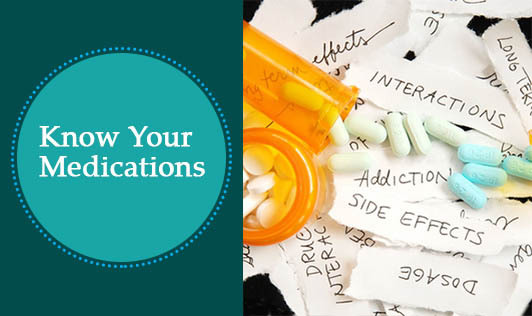 •DON'T change your medication dose or schedule without talking with your doctor. •DON'T use medication prescribed for someone else. •DON'T crush or break pills unless your doctor instructs you to do so. •DON'T use medication that has passed its expiration date. •DON'T store your medications in locations that are either too hot or too cold. For example, the bathroom cabinet may not be the best place for your medication. •DON'T combine multiple medications in the same bottle. Take some ones guidance if you are not sure how to organize your medicines. Keep in touch with your doctor through email if he/she is a busy person and also have his/her mobile for any emergency.